Download our free complimentary white paper and start on the path for sustainable business success. Work culture plays a significant role in all areas of business. From the organization’s brand and reputation with clients to the talent it attracts, culture is involved. So, if you have ever wondered how much behavior impacts a successful work culture, you are in the right place. A poor or unstable work culture doesn’t always mean that an organization is financially failing. These workplaces, however, are typically riddled with unhappy employees, high turnover and lower employee engagement. Some experience active disengagement, which contributes to toxic workplace behavior. If work culture remains stagnant and non supportive, growth and stability are impacted. This means that it is nearly impossible to improve productivity. It also means it is very difficult to save costs when poor behavior has established the conditions for employees to simply not care. No sense of accountability for monitoring and measuring productive behavior and group dyamics. This 31-page, documented white paper details what workplace culture is. It identifies six principles that impact workplace cooperation, which enhance both growth and stability. It provides resource recommendations for improving workplace culture from central behaviors that impact the organizations stated mission, vision, and values. It details behaviors that improve trust, interdependence, genuineness, empathy, risk resolution and success in the workplace. Creating work culture fit for team members starts with educating leaders on the six principles that anchor collaboration and cooperation in the workforce. 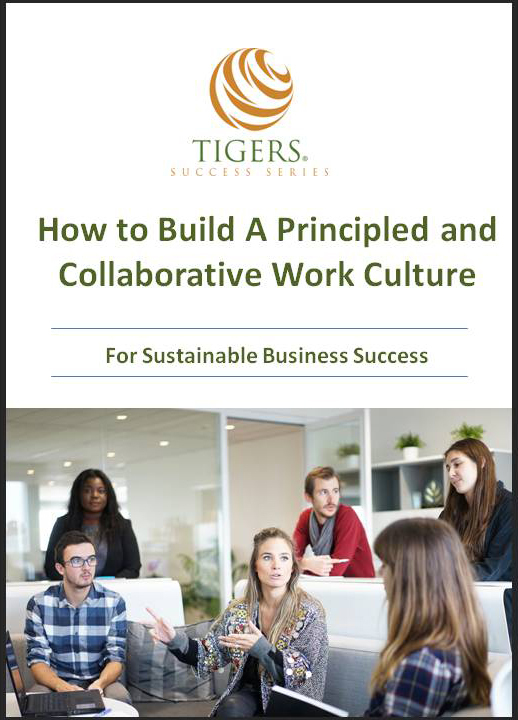 Research-based and validated through Gonzaga University, Boeing, and the Washington State Education Association, learn how the 6 TIGERS Principles™ build collaboration and cooperation in the workplace with measurable results.